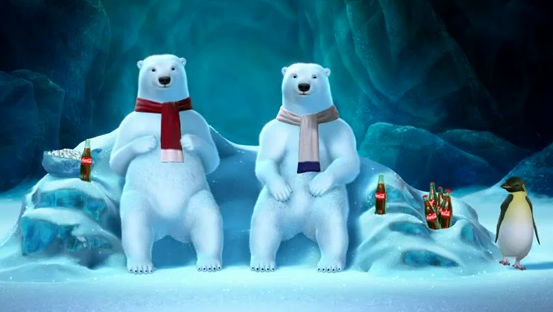 The Coca-Cola polar bears love football. In fact, in addition to starring in three new commercials, they’ll be tuned into NBC’s broadcast – just like millions of fans around the world and sharing their reactions to all the in-game action, ads and halftime show via a live digital stream. For this year’s big game, Coca-Cola is launching CokePolarBowl.com, a unique viewing experience for fans that merges a live digital stream and social media with traditional television advertising. During the game, animators will control the bears and their environment using a combination of traditional video gaming controllers and a proprietary PC-based interface. The animators will be stationed in New York City, in a control room located at MLB Advanced Media, which is a leader in the delivery of streaming content. This is the sixth consecutive year that Coca-Cola commercials will appear during the Super Bowl broadcast. Coca-Cola worked with Wieden + Kennedy in Portland, Ore., to create and produce the CokePolarBowl.com experience and corresponding TV spots. They collaborated with both Framestore in New York and Animal Logic in Sydney, Australia to develop the animations and digital technology.